The technology went on display at the RCA earlier this month, as part of an exhibition showcasing final year projects. 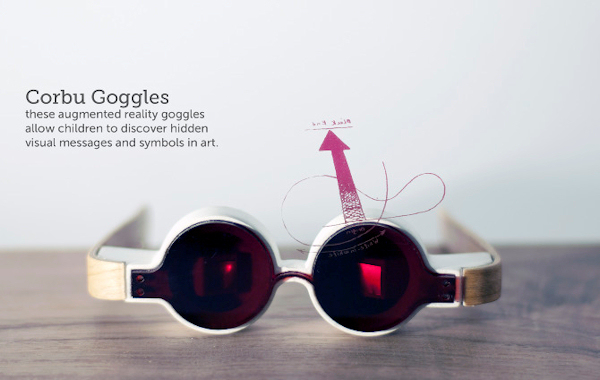 The Corbu Goggles have a camera inserted in front of the frame, which can detect what a wearer is looking at in a gallery. Mr Ling has developed barcode labels that are positioned next the artwork and when the camera detects these, visual information stored in a computer is downloaded into two mini computer screens, positioned in each goggle. The visual information morphs the artwork for the wearer, peeling back layers to show the artistic inspiration behind the masterpiece. Mr Ling has developed a number of demonstrations to show the Corbu Goggles in action. In one of these, the wearer can see the inspiration behind a copy of a painting created by the Dutch artist Theo van Doesburg, the original of which is currently on display in the same gallery that Mr Ling took his nephew to. The painting, called “The Cow”, is an abstract piece consisting of brightly coloured squares. The goggles morph the painting into the original sketch of a cow that the painting is based on. This picture then evolves into an abstract painting of the cow, which was an early version of the artwork, before turning into the final abstract painting. The Corbu Goggles were named in honour of Charles-Édouard Jeanneret, who is better known as Le Corbusier, a famous architect, designer and urban planner and one of the pioneers of the modernist architecture movement. He also taught Mr Ling’s father architecture and in homage to this family connection, Mr Ling has styled his prototype Corbu Goggles on Le Corbusier’s famous round spectacles. Mr Ling’s ‘Sound Brush’ is designed to enable visually impaired children to experience artwork. The technology, which resembles a microphone, works by detecting the barcodes next to each artwork. These prompt a computer to relay audio information to a processer in the device, so that the holder can hear this through a speaker. In one demonstration, pointing the Sound Brush at Theo van Doesburg’s “The Cow”, the user hears a cow mooing to signify the inspiration behind the painting. In another, pointing the Sound Brush at a painting by the artist Jackson Pollock, the holder hears jazz music, as this heavily influenced the artist’s abstract expressionistic painting style. The Harry Potter-style interactive map developed by Mr Ling is made from heat activated material called thermochromatic film. Transistors embedded inside this film are electronically switched on by a computer when it senses, via the barcodes, that a user has seen all the artwork in a space. The transistors then heat up a new section of the thermochromatic film to reveal another part of the map, providing a pathway to a new gallery space for the map user to explore. In the future, Mr Ling hopes to develop his technology further. He is currently looking for an industrial partner to help him to commercialise the interactive tools.